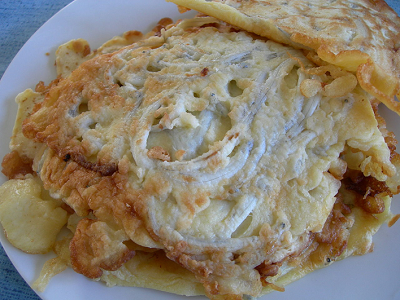 Sciblogs | How many whitebait eggs does it take to make a whitebait fritter? How many whitebait eggs does it take to make a whitebait fritter? Every spring New Zealanders can be found creeping out at the crack of dawn to line the lower reaches of our rivers in the hope of catching that New Zealand delicacy – whitebait! As the mist lifts and the fishing comes to an end for the day, conversations turn to that critical question… what’s the best recipe for whitebait fritters? I don’t claim to have the answer to that, but I do hope to provide some insight into how many eggs might be needed… and the answer might just surprise you! Whitebait are the juveniles of five species of native fish (see Amber McEwan’s article for more details), returning to freshwater after spending the first few months of their lives at sea. This migration into freshwater is a critical part of their life-cycle, as they move upstream to find the habitats where they will feed, grow into adults, mature and then begin the cycle all over again. It is that last aspect, beginning the life-cycle all over again, that I’m going to focus on here. A very large adult inanga. This species typically makes up more than 80% of the whitebait catch. An adult giant kokopu of around 260 mm long. The giant kokopu is the largest of the five species of whitebait, but generally makes up only a very small proportion of the whitebait catch. An inanga spawning site in the Waikato River at high tide. 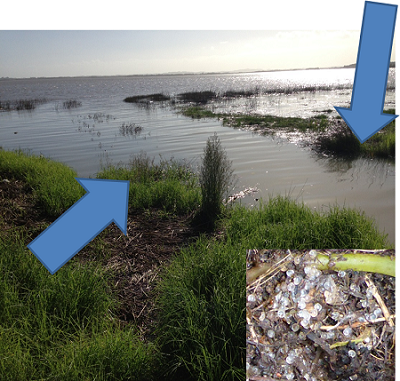 The blue arrows indicate where eggs (inset) were found. An average sized adult female inanga will lay around 2-3000 eggs (McDowall, 1984). Studies have shown that on average, only about 11% of eggs survive to hatch (Hickford et al., 2010). Once the eggs hatch and the larvae make it to sea, survival is very low. No data are available specifically for inanga, but mortality of larval fish in the marine environment has been estimated at >98% (Zeldis et al., 2005). On returning to freshwater, investigations have shown that around 30% of whitebait may be caught in the whitebait fishery (Baker and Smith, 2014). An unknown number of these remaining fish then survive to adulthood and successfully spawn (let’s assume 50%, but it has been suggested this is more likely to be less than 20%). If we assume a cup of whitebait (about 500 fish) is used to make a whitebait fritter, we can work out that it actually takes close to 650,000 eggs to make a whitebait fritter! Baker, C. & Smith, J. 2014. Influence of flow on the migration and capture of juvenile galaxiids in a large river system. New Zealand Journal of Marine and Freshwater Research. Hickford, M. J. H., Cagnon, M. & Schiel, D. R. 2010. Predation, vegetation and habitat-specific survival of terrestrial eggs of a diadromous fish, Galaxias maculatus (Jenyns, 1842). Journal of Experimental Marine Biology and Ecology, 385, 66-72. McDowall, R. M. 1984. The New Zealand whitebait book, Wellington, Reed. Zeldis, J. R., Ooldman, J., Ballara, S. L. & Richards, L. A. 2005. Physical fluxes, pelagic ecosystem structure, and larval fish survival in Hauraki Gulf, New Zealand. Canadian Journal of Fisheries and Aquatic Sciences, 62, 593-610. Dr Paul Franklin is a Freshwater Ecologist at NIWA.